What to Know about Bernedoodle Breeders? Is Bernese Mountain Dog Poodle Mix Right for You? The Bernedoodle is the result of combining a purebred Bernese Mountain Dog and a purebred Standard Poodle. Not like their purebred parents, Bernedoodles are a newer generation crossbreed. Their temperament, size, as well as physical appearance, are left up to genetic traits they favor most from their parents. Crossbreeding and its unpredictability is one of the common issues which arise during debates regarding this practice. Some might find it trivial, but considering the vital role genetics play in physical attributes, health, and character of your canine companions, it is something that should definitely be discussed. Read on to know more about the Bernedoodle dog. Since crossbreeding is still a newer practice, Bernedoodles are fresh additions to the world of dogs. The best thing to learn more about this Poodle mix is to take a look at the respective histories of the purebred parents. Right now, the Poodle is named as France’s national dog. But, Poodles were actually originally bred in the country of Germany almost 400 years ago. During that time, the Poodle was famous for his duck hunting skills. In fact, this is where the famous haircut of the Poodle came from. Used today mainly in shows, the flamboyant coat style of the Poodle was originally meant for practical reasons. Those complex poms on the legs, chest, tail, and head of the Poodle were meant for helping them swim faster. These also offer protection to the more sensitive body parts while hunting in the freezing waters. It was not long before the Poodle rose to become more popular not only for their hunting skills. They soon amaze circus audiences with their stunning coat. But, more than the beauty of the Poodle, more things make them mesmerizing to the eyes of people. The Poodle is also extremely intelligent and can even quickly pick up and learn tricks, making them the ideal addition to any theatrical acts. 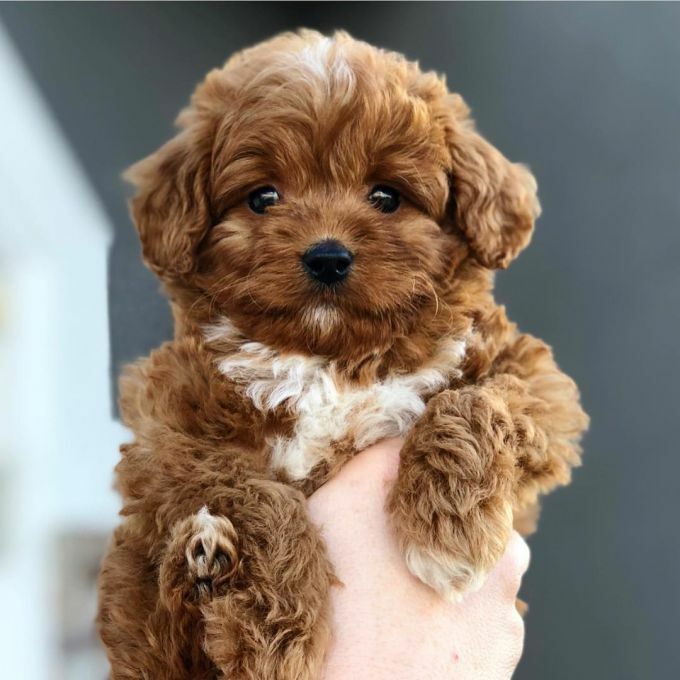 That is why it is not a big surprise that eventually, the Poodle found himself stepping outside the circus to roam around France and Europe, serving as the companion to noblemen who want to show them off for their graceful gait and extravagant coat. Considering the origin of the Poodle, it is safe to say that their history is a rag to riches one. How about the Bernese Mountain Dog? The Bernese Mountain Dog has its origins from Switzerland wherein they roam around the Swiss Alps. Originally known among locals as Dürrbachhund, inspired by the name of Dürrbach, the small town where they originated, the Bernese Mountain Dog was first used as working farm dogs. Although they spent most of their time guarding livestock and property, they also help dairymen and shepherds herd cattle from pastures to farms over extended distances. Back in the early 1900s, most dog enthusiasts started to present this large and beautiful breed in Berne shows. Shortly after that, the popularity of the breed skyrocketed. Today, the Bernese Mountain Dog and the Poodle are incredibly famous family pets, well known for their friendly nature, work ethic, and intelligence. With two interesting histories as rich as that of the Bernese Mountain Dog and the Poodle, it is easy to see and notice the appeal in the offspring which carries the traits from the parent breeds. It is always going to be hard to know the exact appearance of a crossbreed puppy. He can inherit an extensive array of physical traits from either of the purebred parents. This is the reason why the Bernedoodle can look different in many ways. This means that things such as height, weight, texture, and coat color will vary according to what specific parent the Bernedoodle has taken after the most. As mentioned earlier, crossbreeding has its own share of controversies. Among the problems is the inability of predicting with certainty the kind of temperament that your crossbred can inherit from the purebred parents. For this reason, both the Bernese Mountain Dog and the Poodle share some similar behavioral traits which will be possibly passed on to Bernedoodle puppies. For instance, both the Bernese Mountain Dog and the Poodle are intelligent breeds that are very friendly and alert. They can bond well with the members of their family and enjoy participating in different family activities. The two breeds are also famous for doing well with kids. However, there are still several traits which are unique exclusively to the Bernese Mountain Dog and the Poodle which may not be passed on to the Bernedoodle puppy. For instance, the Poodle can make an amazing student that is always eager to please and loves to learn new tricks. They are also incredibly active, which also means that they require a constant amount of play and exercise. In spite of the size, the Bernese Mountain Dog, on the other hand, is more docile compared to the Poodle. They love lounging around their home and observing his family from a cozy and nice spot in a corner. However, this doesn’t mean that the Bernese Mountain Dog wouldn’t enjoy a good run around the yard. They can also be your perfect hiking or jogging partner. Keep in mind that the Bernese Mountain Dog used to be a working breed, and has been accustomed to walk distances. This is the reason why the Bernese Mountain Dog will need enough exercise as well in order to stay strong and fit similar to the Poodle. As far as crossbreeds such as the Bernedoodle are concerned, you will have to deal with a dog with a parent that is hypoallergenic and a parent that isn’t. While poodles don’t shed, Bernese Mountain Dogs have longer coats that shed profusely and needs consistent grooming and brushing. It is more likely that your Bernedoodle would shed, yet a bit slight only. It is recommended to brush him with wire brushes to collect dead hair once a week. Aside from that, both Bernese Mountain Dog and Poodle only require bathing occasionally so that you may rely on the same for your Bernedoodle adult. Your Bernedoodle should have its ears cleaned and checked weekly to avoid the infections caused by moisture and waxy build-up. He’ll also have regular nail trimming so as not to encounter cracking and splitting like the occurrences that may cause pain and infection to Bernedoodle. A poodle is more active slightly compared to Bernese Mountain Dog, yet both breeds require adequate attention, play, and exercise. The same basically goes for Bernedoodle puppies. Daily walks are recommended, and experts also advised owners to let them have time to romp in the yard and play. Bernedoodle also enjoys trips to a local dog park or hike in the wild. However, if there is one thing you should keep in mind with Bernese Mountain Dog is that it doesn’t tolerate heat well and it could translate easily to its puppy. Take note of this when allowing this Bernese Mountain Dog Poodle mix outside to play for an extended period of time. You should also ensure that there’s an adequate shade and lots of access to fresh water with your dog that enjoys outside always. Like all breeds of dogs, it is recommended to train and socialize Bernedoodle puppies at an early age to make sure that they will grow up as well-adapted dogs. Basically, it’s still not clear if crossbreeding is the real solution to generational health issues, which have been problematic for the purebred dogs. Due to this, it is best that you are aware of the health problems the purebred parents of Bernedoodle are predisposed to. For example, Poodle has a life expectancy of ten to eighteen years. Poodles can also be prone to health issues including bloat, hip dysplasia, thyroid problems, progressive retinal atrophy, Addison’s Disease, hypoglycemia, and epilepsy. On the other hand, Bernese Mountain Dogs have a shorter lifespan, which extends anywhere from seven to ten years. These dogs are frequently predisposed to mast cell tumor, bloat, elbow dysplasia, and hip dysplasia. As mentioned earlier, Bernese Mountain dogs do not do great in hot environments. You may get rid of the risk of Bernedoodle heatstroke through being knowledgeable of the temperatures outside when going for a walk or giving him the time in the backyard by himself. The early health screening for Bernese Mountain Dog Poodle mix is an option that many would recommend to most pet owners. It can help you prevent and prepare for particular health problems you might end up encountering in the long run. To know more about the requirements on health screening specified by AKC or American Kennel Club for Standard Poodle and Bernese Mountain Dog. Finding Bernedoodle puppies from reliable sources are probably one of the most crucial things you could do for yourself as well as your potential dog. You may avoid a massive headache through doing a bit of research as well as going through the right resources. When looking for puppies, it is recommended to look at every available option. Do you like to go through shelters or would you stick with finding a good breeder in your local area. If you have sights set on adopting Bernedoodle from local shelters or Bernedoodle rescue, take note that there’s a chance you might not find the crossbreed easily. Never set up yourself for disappointments. 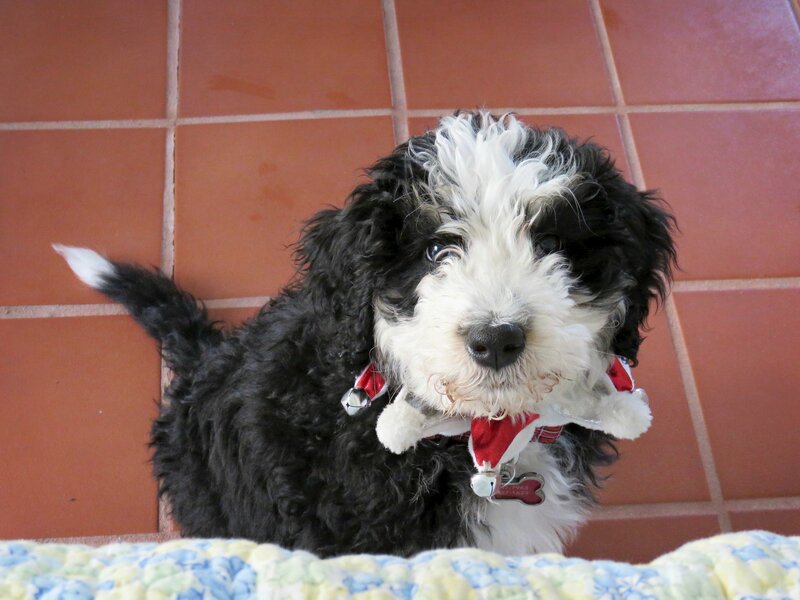 Try to call your local shelters and ask to be notified when the Bernedoodle arrives. Other than that, you have to make sure that you ask questions about the different health screening options, backstory the shelter has for your Bernedoodle like where it came from as well as how he wound up there. You must also ask about temperament issues. It is also important to bear in mind that even shelters are a fraction of the cost of the breeders, you have to pay for the adoption fees, which may run anywhere from $50 to $100. 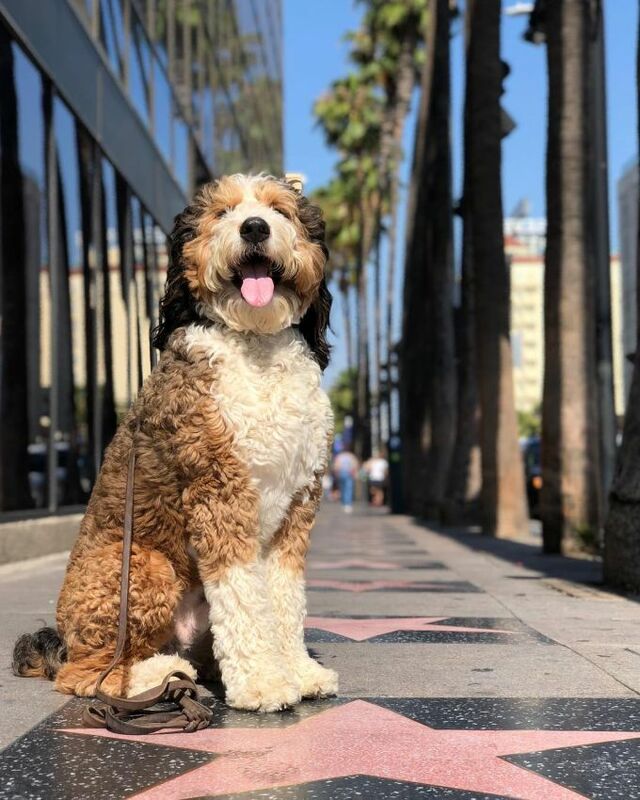 Shelters will frequently cover initial veterinary fees for ensuring that your Bernedoodle is happy, healthy, and ready for you to take him home. If you’re planning on going to Bernedoodle breeders to buy your puppy, expect that the cost will drop anywhere from $500-$1000. 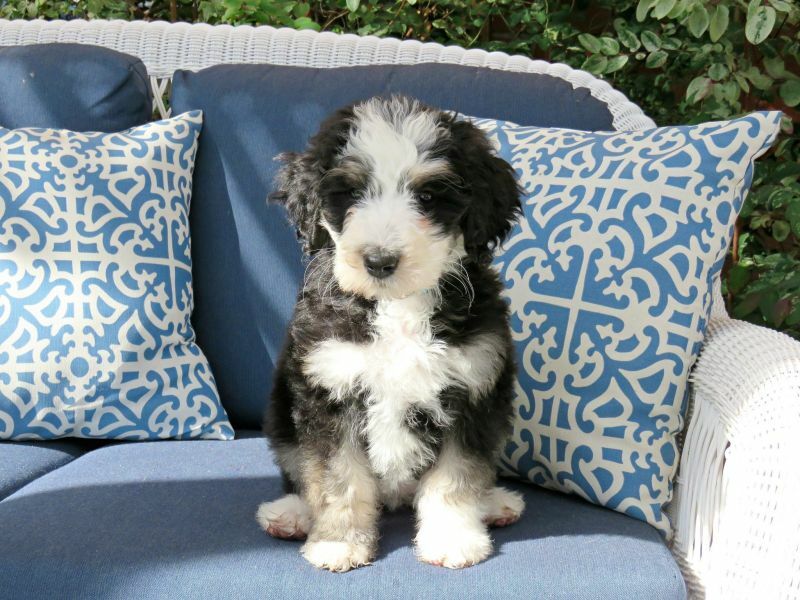 Bernedoodle price will differ depending on the breeder and the purebred parents of Poodle Bernese Mountain Dog mix. Nevertheless, it is important to note that just because you decide to go to Bernedoodle breeders, it does not mean that you are in the clear. Still, make sure to ask lots of questions about health issues and temperamental with previous litters or Bernedoodle parents. Reliable breeders must have certificates to prove that their dogs were screened for any temperamental and health issues, so never be shy about asking for such questions. 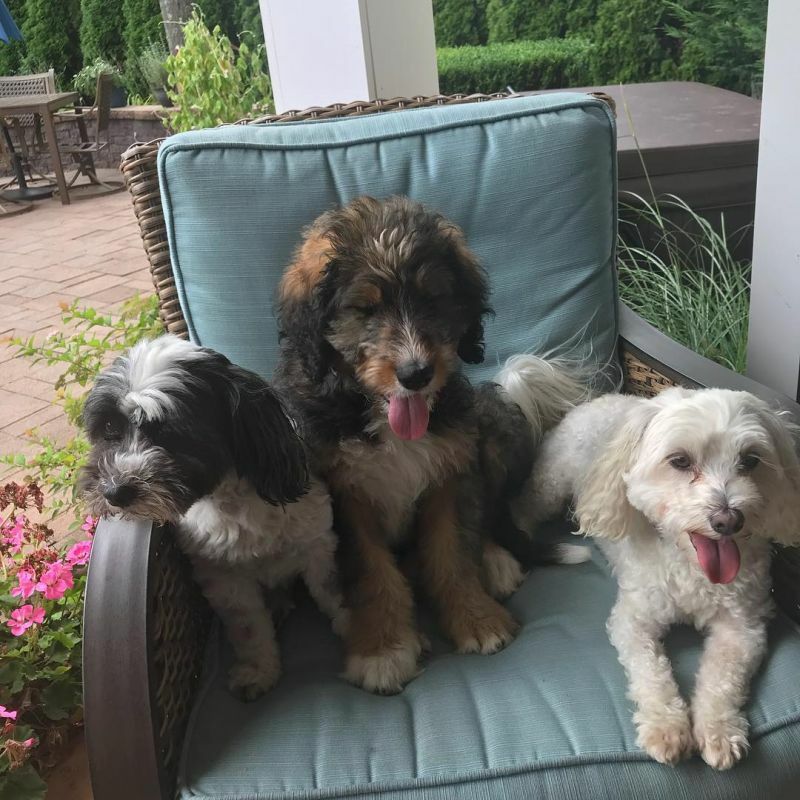 Both Bernese Mountain Dog and Poodles are intelligent breeds of dogs who love being around their family and do great with kids, so expect that Bernedoodle will behave similarly. 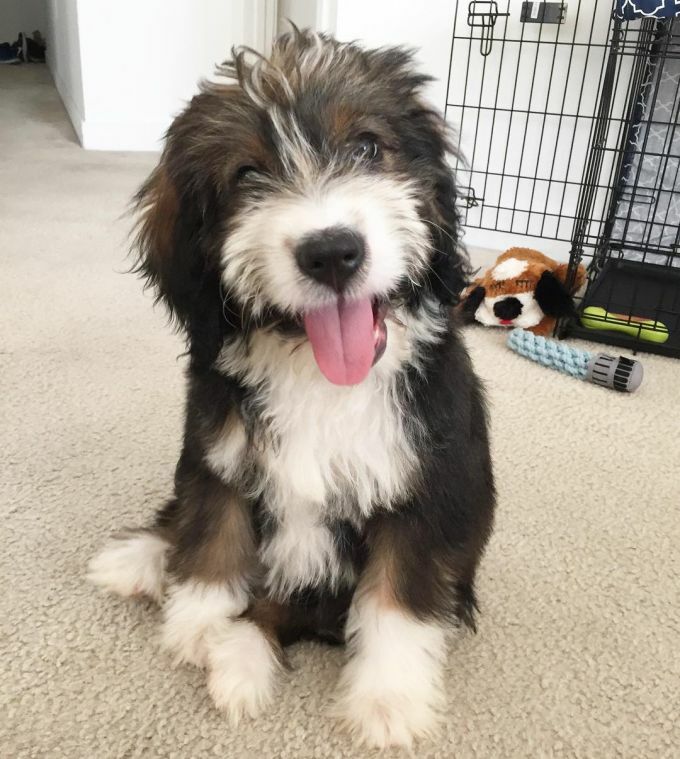 Chances are, Bernedoodle will be a big and active crossbreed who would do great in homes with yards instead of smaller apartments. In addition to that, take note that hotter climates might not be suitable for your Bernedoodle. If you do not mind a few shedding and if you can exercise and train your Bernedoodle on a regular basis, it is the right and probably the most ideal crossbreed suited for you and your preferences! I have a Bernedoodle and felt a few of the notes were off. For instance Bernese Mountain Dogs’ brains mature at a much slower rate than most dogs making them seem a quite a bit slower than most other breeds. Poodles in the other hand are exceptionally smart, as the article said. Also, $500-$1,000 for a Bernedoodle is unheard of. It unheard of to get a puppy like this for under $2,500, and that is still a very cheap Bernedoodle; you be lucky to find one priced at that. I spoke to as many breeders are possible before committing to this breed and they all said this is a tremendously social dogs. My pup believes she is every strangers best friend! With all of this being said they are absolutely wonderful and happy pets so long as you meet their daily needs! I have a one year old Bernedoodle male who is the love of everyone’s life. He is affectionate, loyal, smart and goofy. I paid $1000.00 for him. This is from a small Bernedoodle breeder. He is also big, weighing 90 pounds at 13 months.He is a lover of food, mooching wherever he can. He understands ” no, this is not for puppies”. I would not trade him for a million dollars.